The two largest estuaries on the East Coast of the United States are sick. The Chesapeake Bay and the Delaware Bay are both losing marshland to rising sea level, and it is not likely to get any better, according to Michael Kearney at the University of Maryland. Loss of these marshes would be devastating to plants, animals and water quality, and would release large amounts of carbon into the oceans and atmosphere. Based on research to be published in next week's Eos, Kearney and colleagues say that 70 percent of marshland in the two bays is in poor health. And of that, 20 percent is severely degraded. "If you're looking at the overall picture, that means there's only about 30 percent of the coastal wetlands in the Chesapeake and Delaware bays that could be considered healthy," Kearney says. "That is somewhat surprising, but not really surprising, because we've been documenting large losses through aerial photography and site visits since 1980. Everywhere we go, marshes don't look like they're in good shape." 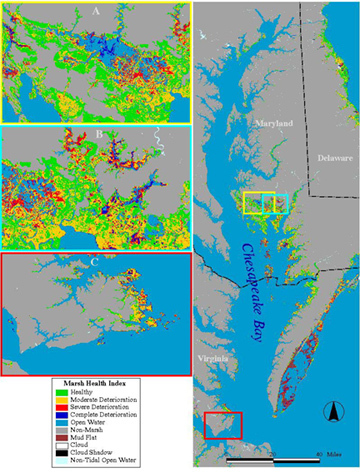 Kearney's team used images and data from the Landsat Thematic Mapper instrument from 1993 to create a picture of the overall health of 140,000 hectares (about 346,000 acres) of marshland in the Chesapeake and Delaware bays. They measured the amounts of vegetation, soil or sediment cover, and water cover for the marshes. "The idea is that as the marsh is lost initially, the vegetation begins to decline. Then you get bare soil, and eventually with severe loss, you simply have water -- the marsh is gone," Kearney says. This marsh health model for the Chesapeake Bay shows the levels of degradation, represented by different colors. The most severely deteriorated marshlands are in red. Image courtesy of Michael Kearney. Combining the 1993 the satellite measurements with observations and classifications from continuous field testing and aerial photography since that year, Kearney's team created the marsh health model. The model is a rapid, large-scale assessment, he says, that can look at the long-term effects. Although the data they worked with are nearly a decade old, Kearney says, degradation is continuing to increase because the marshlands cannot keep pace with rising sea levels. "The only unifying thread that could cause these losses in both areas is sea level. We know this from almost two decades of field studies. In almost every case, where the marsh is being lost, it's because the marsh is not growing fast enough upward to keep pace with the rising water level." Marshes grow both by trapping sediment at high tide and through the production of organic matter by the plant life. Unlike many marsh systems, those in the Chesapeake and Delaware bays primarily grow upward through the accretion of organic matter, not sediment. That's a slower process, Kearney says -- only about 2 millimeters of growth per year. "This was never a big problem until about 1850, because for most of the past 2,000 years, the rate of sea level rise along these coasts was pretty slow." Before 1850, the rate of sea level rise was about a half a millimeter per year and now it is 6 times that rate at 3 millimeters per year. The slow marsh growth coupled with increasing sea level means that the marshlands are falling behind, on average, a millimeter per year. "Every year, they're accumulating a deficit, becoming more and more water-logged. And eventually, the plants die." Kearney adds that in Delaware Bay, impoundments, which limit stream flows into the bay from New Jersey, have degraded the marshlands on the Bay's coast more than on the Delaware shore opposite. Kearney says he worries that with global warming on the rise, sea level rise will continue and so too will marshland loss. The same processes, he says, are affecting the Chesapeake and Delaware bays as affecting all Atlantic coast marshes.